The beauty and seeming simplicity of this Steve Hanks painting gives little hint of the complexity within it. Each child interacts with the rain differently. As we grow older our perspective broadens and nowhere is this more obvious than with children. As with many Hanks paintings, Summer Rain is a metaphor for life. 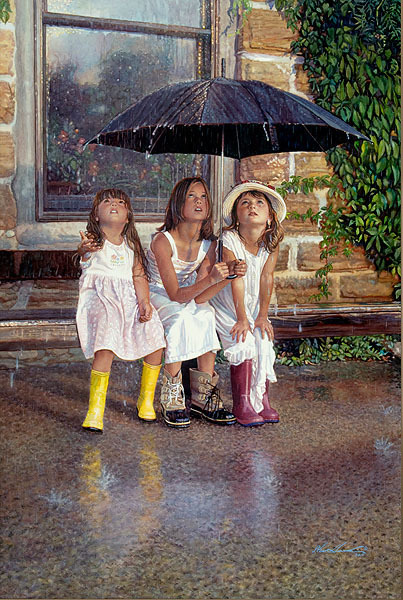 The umbrella and companionship offer these girls shelter from passing storms. They will master the simple steps of living and then apply them to life’s harder challenges. “This is a recent painting I did on Clayboard,” says artist Steve Hanks, “a surface that still amazes me as a watercolor artist. The colors are brighter, the rainwater and reflections are even more realistic.” Summer rain is a passing necessity for everything that grows and a thing of wonderment to the young.